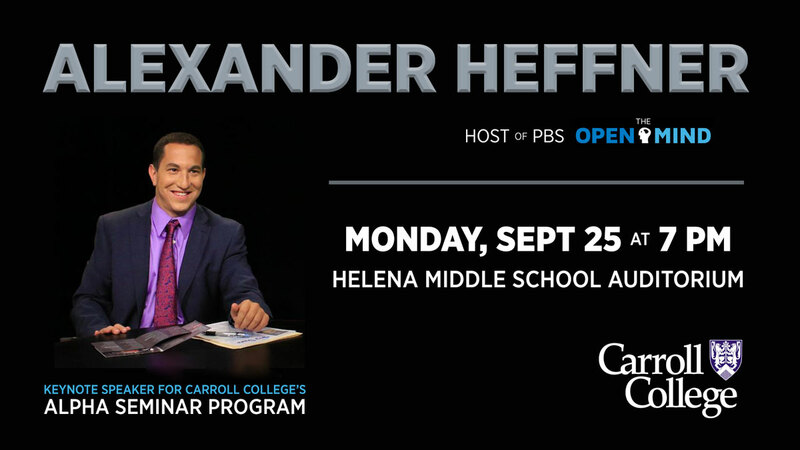 HELENA–Carroll College has invited Alexander Heffner, host of the PBS series "The Open Mind," to provide a lecture to the Helena community exploring "Civil Discourse in an Uncivil Age: The Quest for a Post-Partisan America" on Monday, September 25 at the Helena Middle School. This event is sponsored by the Carroll College Alpha Seminar program and the Apgar Foundation. Mr. Heffner is the keynote speaker for Carroll College’s Alpha Seminar. Alpha Seminar is a unique course taken by first-year students during their initial semester at Carroll. Its purpose is to introduce students to the distinctive practices and values of a Catholic liberal arts education while focusing on critical reading, writing and thinking. Mr. Heffner will meet with the Alpha classes prior to his public lecture in the evening. “It is essential that the next generation work to reassert our collective American citizenship, leadership and values...to protect the sanctity of civic life in 2017 and beyond," said Mr. Heffner.